Rohit Sharma became the third player to hit more than 100 sixes in the T20 Internationals during the second game of the three-match series. He smashed four maximums during his 29-ball 50 in the 159-run chase along with three fours and in the process, crossed the three-figure mark as far as the sixes is concerned in the shortest format. 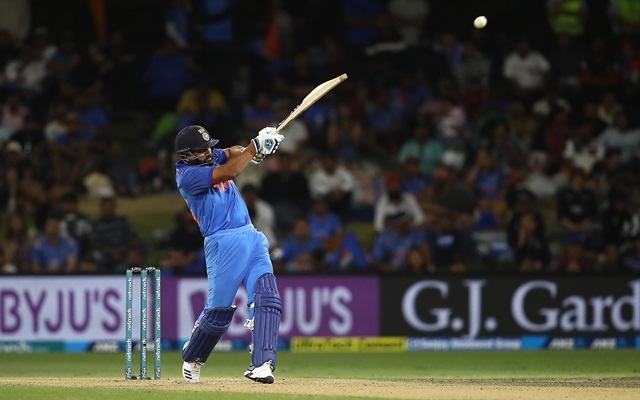 Rohit came out to bat with 98 sixes to his name and ended up only a maximum short from being the joint highest. Rohit managed to achieve this feat in 84 innings and has amassed 2288 runs (including his 50 in the second T20I). He has also crunched as many as 204 fours in his T20I career so far and might be topping the list in that aspect. 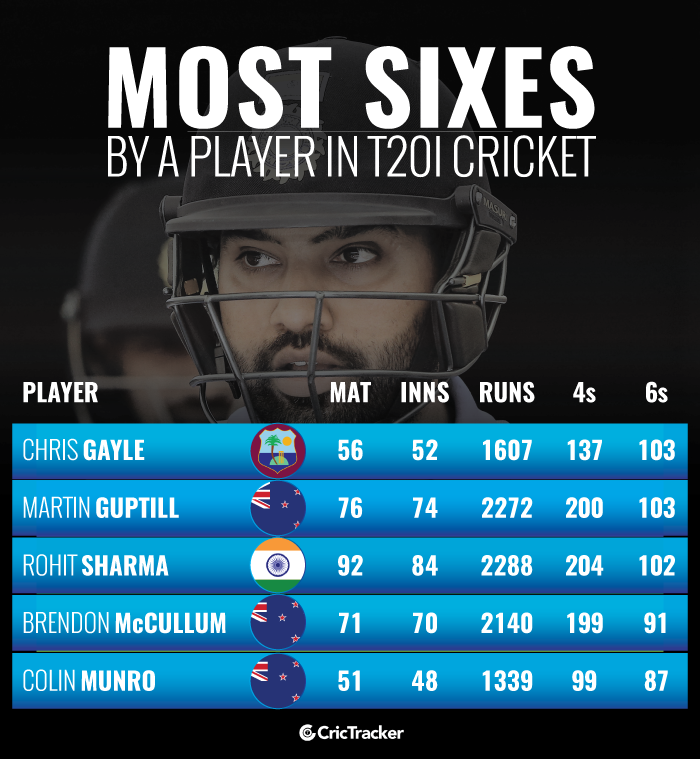 The Indian captain, however, became the first from his country to reach the milestone and is the only one in the top five in terms of sixes in the T20I format. Chris Gayle, not surprisingly, tops this list with as many as 103 sixes to his name in the shortest format at the highest level. He has managed those many maximums only in 52 outings scoring 1607 runs. Moreover, the number has got stuck at 103 for a long time as he hasn’t played for Windies in the last few months plying his trade in the different T20 leagues across the world. Martin Guptill is the other cricketer to hit the ball out of the park more than 100 times in the T20Is. He is on equal terms with the Universal Boss at 103 sixes in 74 innings amassing 2272 runs for New Zealand. Brendon McCullum and Colin Munro are the other two Kiwi players on the charts in the top five with 91 and 87 sixes respectively. While the former has hung his boots from international cricket, Munro looks set to become the second New Zealand player to reach the 100 sixes in the shortest format at the highest level.